with a color coded, powder coated base. Call for base, pole or hook part pricing. and a space-saving, color-coded 16" diameter base. Since most IV stands look the same, tracking these stands and other mobile equipment create challenges at many facilities. Asset management, scheduled cleaning and maintenance become more difficult. What happened to our IV poles? They're all gone! adult infectious disease and other high risk areas to patient rooms and pediatric units. Now these issues can be addressed with color coded IV stands available with Red, Green, Yellow, Blue or Charcoal bases. Other optional base colors are also available. Separate IV stands by department or nursing floor. Identify where a pole belongs based upon its base color. 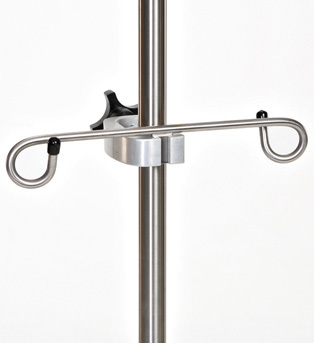 These quality IV Stands feature a stainless steel pole and a 16" diameter space-saving base. Heavy-duty base weighs 22 lbs. for unmatched stability. Includes 3" scuff resistant casters. End of every leg is capped with a rubber boot to protect your walls and doors. Height adjustable from 52" to 94" by simply turning the soft touch "no lose" screw knob. Choose from two hook, four hook or six hook design. All prices quoted are FOB Factory. Freight is pre-paid & added to invoice. Prices subject to change without notice. Terms & conditions. Updated 1/19. pole with a color coded, powder coated base. and a larger, more stable, color-coded 22" diameter base. 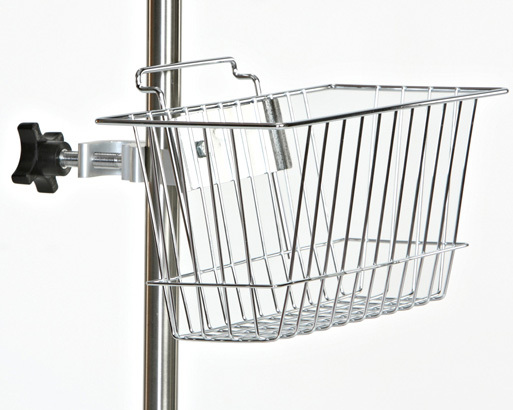 These quality IV Stands are available with either a stainless steel or chrome-plated pole design. They feature a low profile 5 leg, 22" diameter base that provides greater stability. Includes 3" scuff resistant casters. Height adjustable from 50" to 92" by simply turning the soft touch "no lose" friction knob. Choose from two hook or four hook design. knob. Base weighs 23 lbs. knob. Base weighs 22 lbs. 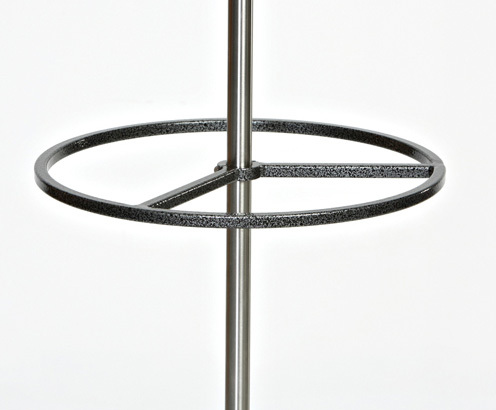 5 Leg, 22" diameter with Stainless Steel Pole and Low Profile Base. 1" diameter Stainless Steel pole adjusts 52" to 94". Includes a "no lose" friction knob. Base weighs 21 lbs. and includes 3" scuff resistant casters. Note: Standard base color is Charcoal. Base is also available in Red, Green, Yellow and Blue. 5 Leg, 24" diameter with 1" diameter Chrome-plated pole, height adjustable from 52" - 93". Epoxy coated base and rubber bumpers help protect walls. Includes a friction lock knob. 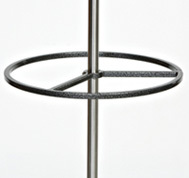 5 Leg, 22" diameter with 1" diameter Chrome-plated pole and plastic base. Height adjustable from 45" to 82". Built to fit your budget. 180 degrees for easy storage. 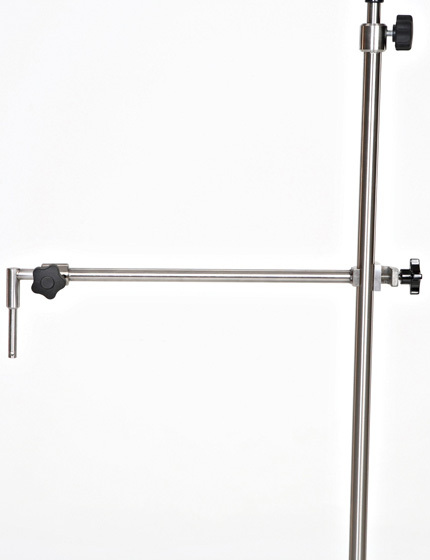 Stainless Steel pole is height adjustable from 15" to 30". to the left except it is mounted to a surgery table. It includes a unique clamp that mounts pole to most surfaces up to 1¼" diameter. Clamp rotates 180 degrees for easy storage. 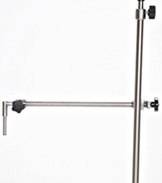 Stainless Steel pole is height adjustable from 15" to 30". Features Stainless Steel construction for longevity. This Stainless Steel Towbar is great tool for transporting multiple poles at one time. bar accessories up to 3/4" diameter. tray measures 13" x 9". size tanks up to 4½" diameter. Features durable Stainless Steel construction and a slim design which is easy to clean. Mounts to I.V. 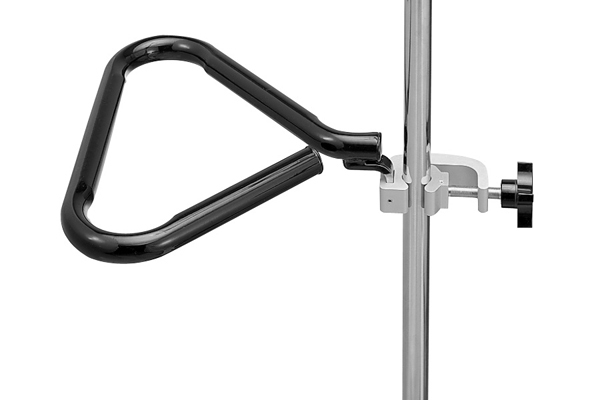 pole with a Universal Clamp (sold separately). push them at the same time. The Stainless Steel I.V. Towbar drops into a hole found on most stretchers and wheelchairs. Towbar mounting pin is 1/2". Adjustable from 20" to 30". 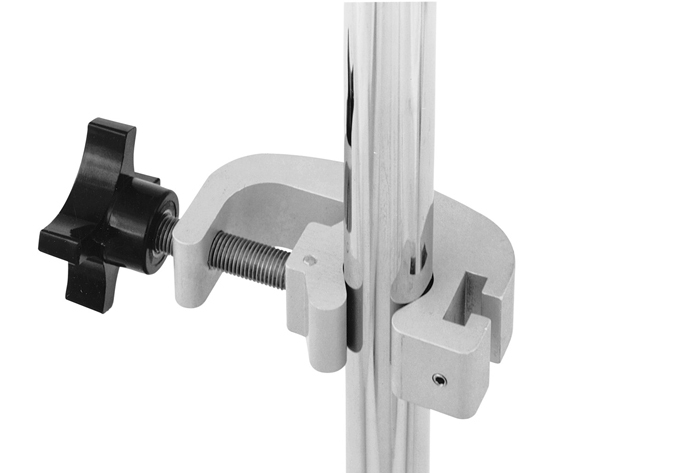 Integral clamp easily clamps to I.V. pole up to 1¼" diameter. It will clamp anywhere on to a 1"
pole with two allen screws. 6" wide x 12" long x 6" deep. bags to an I.V. pole. Why pay $3,000 with our competitor for a Lift Assist I.V. Pole/ Irrigation Tower? Lift-Assist I.V. Poles/ Towers help reduce employee back injuries. Now you can buy a sturdy, reliable tower for less than $1,500! 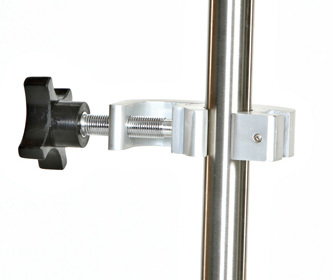 Easily lift heavy loads within seconds by simply turning a crank. One full crank turn equals 1" of vertical travel. Weight capacity: 70 lbs. No electric motors or hydraulic pumps to be concerned about or replace. 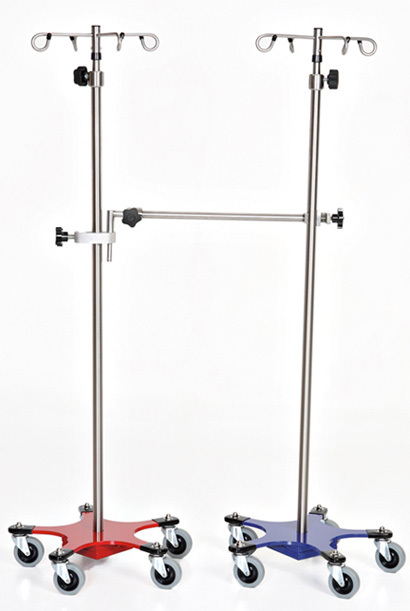 This height adjustable unit adjusts from 56" to 96" high. Saves money initially and will outlast its peers. Six leg base offers the stability you need. Base post is 2" square stainless steel tube. 3" inch scuff resistant casters provide unmatched maneuverability. Choose from a variety of optional accessories as shown above. SW-40-252 Eight Hook Lift Assist Unit: $1,127 SW-40-258 Urinal Bag Hook: $27 Please contact us for a quotation. Updated 1/19. All prices quoted are FOB Factory. Freight is pre-paid & added to invoice. Prices subject to change without notice. Terms & conditions. 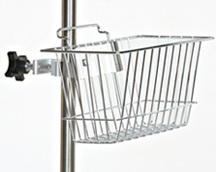 IV-33 Clinton 6 Leg Infusion Pump Stand, chrome plated pole with either two hook, four hook or six hook choices. Includes an oversized base for stability, single knob height adjustment and detachable ram's horn hooks with plastic tips. Height range: 56" to 99"; 45 lb. load capacity. Available in four or six hook. Both feature a six leg, enamel coated, ultra heavy, tip resistant steel base with Black end bumper guards. Stay in place knob will not fall out. Extra rigid, pole-in-tube mounting system. Height range: 62" to 102". 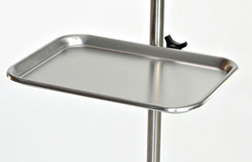 IV-52 Clinton Infusion Pump Stand, chrome plated with five leg, easy to clean nylon base. Heavy center weight adds stability. 19" diameter base saves floor space. Includes single knob height adjustment and detachable ram's horn hooks with plastic tips. Height range: 52" to 92"; 45 lb. load capacity. 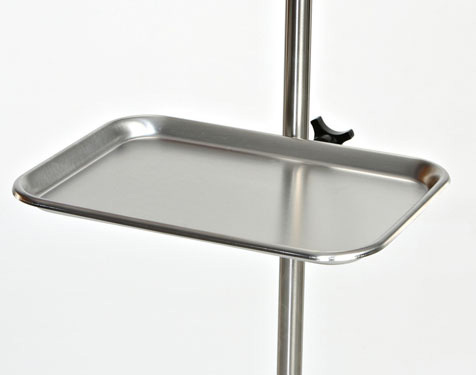 IV-610 Clinton Infusion Pump Stand, chrome- plated, 6 leg space saver. Available in two, four or six hook. They feature a six leg, enamel coated, tip resistant 16" diameter base with Black end bumpers. Includes an extra rigid, pole-in-tube mounting system. Height range: 53" to 93". is used to mount most accessories without disassembling pole. Easy position adjustments. Clamps to pole with thumb screws, no clamp needed. It pivots for easy storage! Strip with 6 hospital grade outlets and a 6' cord. 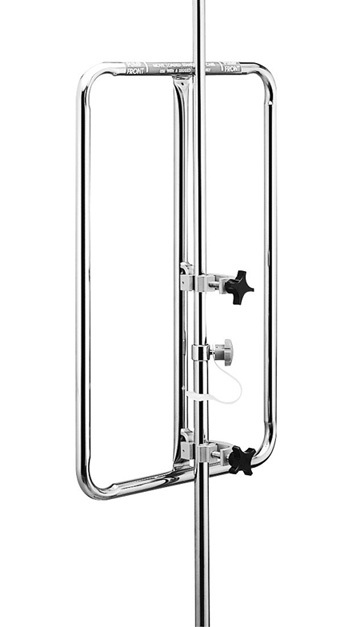 #IV-44 Oxygen Cylinder Holder features a chrome plated steel frame. Holds D or E size oxygen tanks. Requires 1 Universal Clamp, sold separately. Suitable for most 6 leg IV stands. #IV-42 Infusion Pump Frame measures 17¾" wide x 27¾" high. This 1" diameter chrome plated steel frame holds up to 4 IV pumps. sold separately. 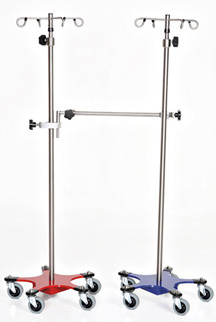 This frame is suitable for most 6 leg IV Stands. for IV-610, IV-614, IV-616, IVS-702, IVS-704 and IVS-706 IV Stands only. Color code your IV poles by dept. Sold in sets of 6 ea. to certain IV pole bases. includes 4 rams horn hooks and 4 open hooks. Features stainless steel construction. Fits 1" diameter pole only. Note: Weight capacity for all Clinton Industries I.V. Stands is 45 lbs. Heavier bags should be balanced on both sides to prevent tipping. *The weight capacity of the IV Hook product is largely dictated by whether or not the bracket is mounted into sheet-rock or directly into a stud. To be on the safe side, no more than 10 lbs per hook is recommended. All prices quoted are FOB Factory. Freight is pre-paid & added to invoice. all welded design with 2" swivel casters for easy mobility. Height adjustment from 68" - 108". 4 leg base, stainless steel. Pedigo hand-operated friction lock adjustment, 5 leg, stainless steel. Note: The P-576 is similar to P-1572. It is a light duty, chrome plated pole for office settings. It is shipped knocked down, ready to assemble. Pedigo quick and easy foot-pedal height adjustment, 5 leg base, stainless steel. 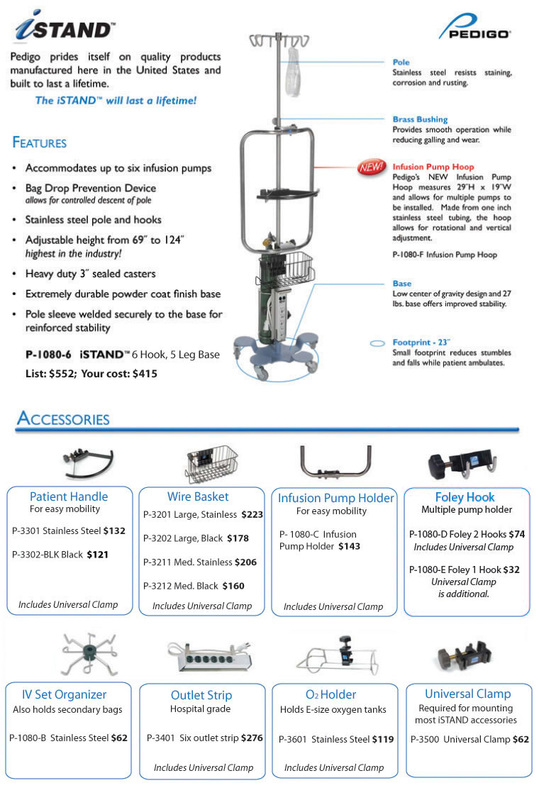 Brewer Heavy Base IV Stand. Crafted for stability. Includes tough 4 leg epoxy coated steel base, rubber wheel ball bearing casters and rubber bumpers on legs to protect walls. 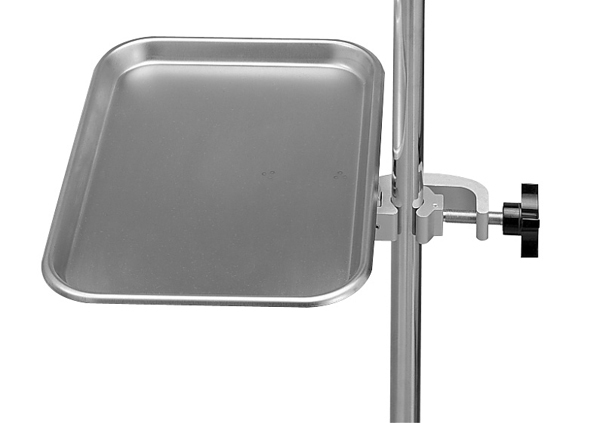 Features chrome plated top post assembly. 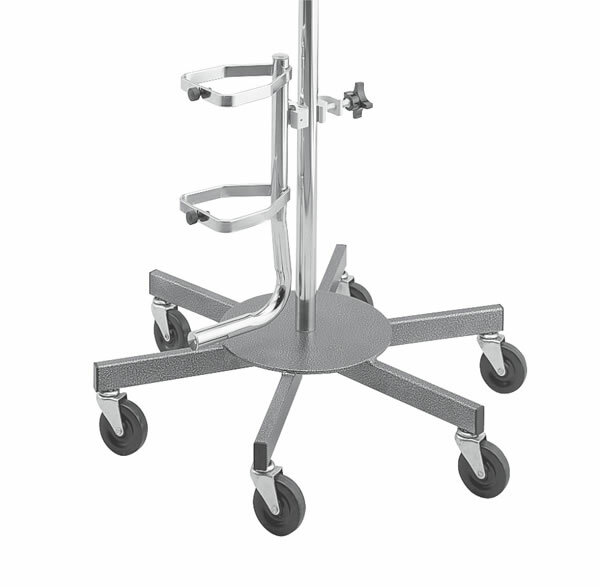 Brewer Four Leg IV Stand with epoxy coated steel base, chrome plated steel tubing and dual nylon wheel casters. bearing casters. Exclusive "no loss" knob. to hold just one pump. #43430 Infusion Pump Frame. Mount up to 4 pumps, easy mounting. #43429 Oxygen Cylinder Holder. Holds "D"
steel tray, 9¾" x 13½". Note: Weight capacity for all Brewer I.V. Stands is 45 lbs. Heavier bags should be balanced on both sides to prevent tipping. The #43408 and #43409 I.V. 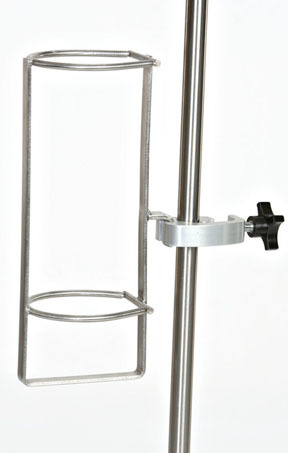 Stands are better suited to handle an unbalanced weight load because of their very stable, heavy duty base. Average delivery time is 1 to 2 weeks depending upon availability. Clinton and SW-40 brand products updated 1/19, Brewer pricing not yet updated; Copyright 2005 - 2019, SW Med-Source Inc., All Rights Reserved.